Wandering around a place where 75 million years ago dinosaurs were still enjoying the sun that cast a fiery orange glow on the rock formations on which they stood. Gazing mindlessly at tiny grains of sand that – while producing a singing sound – seem to dance on the yellow-white sand dunes. Feeling fresh water splash around in a narrow gorge where ice lays all year round in the shadows of the rocks. 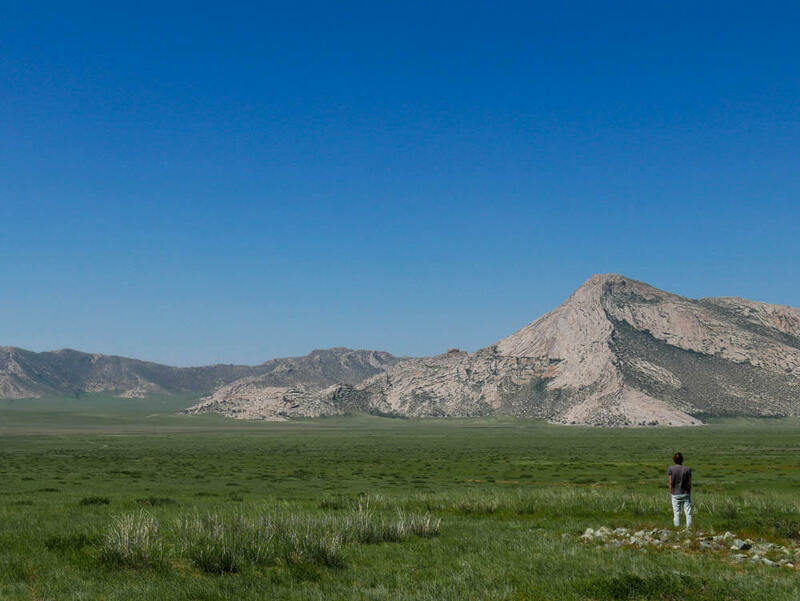 Few countries know how to combine a road trip so well with an off-the-beaten-track experience as a jouncing tour through the Gobi. The trip is at the same time both breathtaking as a true rollercoaster. A rollercoaster that, if you know these 13 things, will be a lot more pleasant. The Gobi Desert, with its 1.3 million square kilometers (= 31 times the size of the Netherlands! ), is the fifth largest desert in the world and the largest in Asia. 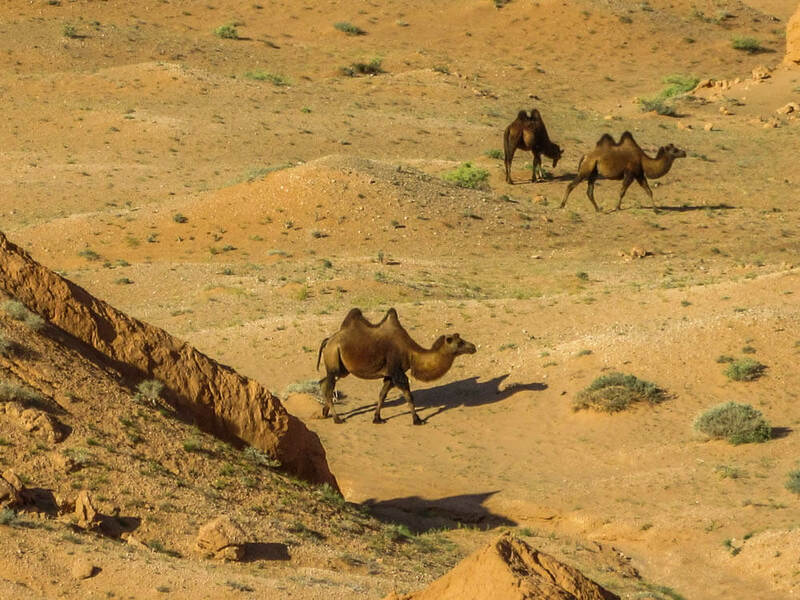 So it is not all that surprising that the desert is called ‘Gobi’: meaning ‘very big and dry’ in Mongolian. The desert region not only covers the south of Mongolia, but also large parts of north and northwest China. Are you afraid the heat will turn you into a sweaty Betty? Think again. The Gobi desert belongs to the so-called cold deserts, meaning that in winter the temperature can drop to -40° C (-40 ℉) and even snow may drizzle on its dunes. In summer, the temperature can rise to 45° C (113 ℉), but not to worry: overall the temperature is more somewhere in between. 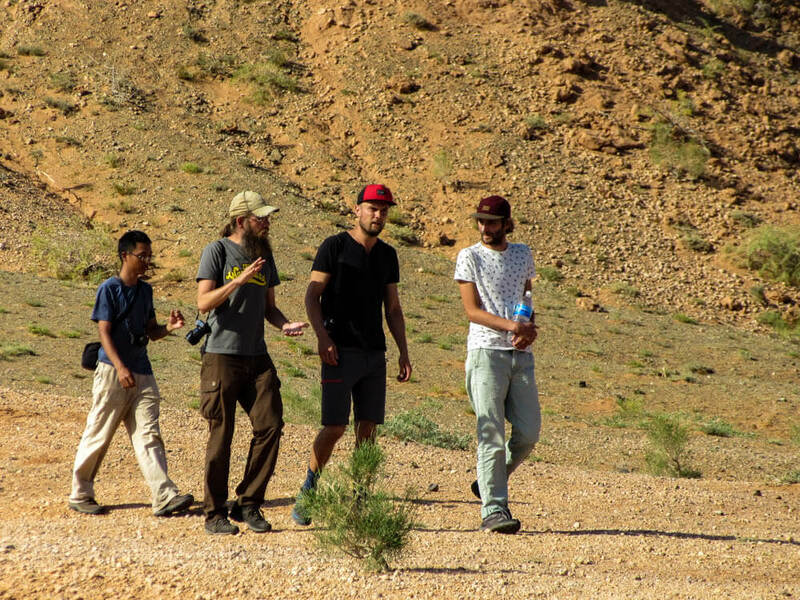 I visited the Gobi in full summer season (August) and it was totally fine with a temperature of 30° C (86 ℉). Taking the Netherlands as the starting point – because hey, I’m still a Dutchie – you can currently fly from € 511,- to the capital of Mongolia, Ulaanbaatar (you’ll have to transfer at least once), but € 700,- is a more realistic price. I consistently book with Skyscanner, because I love their option to search by “cheapest month”, which will give you an overview of the lowest prices. Having said that, flying is of course twenty times less interesting than entering the country via the magical Trans Mongolian Express to start your Gobi desert adventure. Here I told you why you absolutely should make that trip as well. 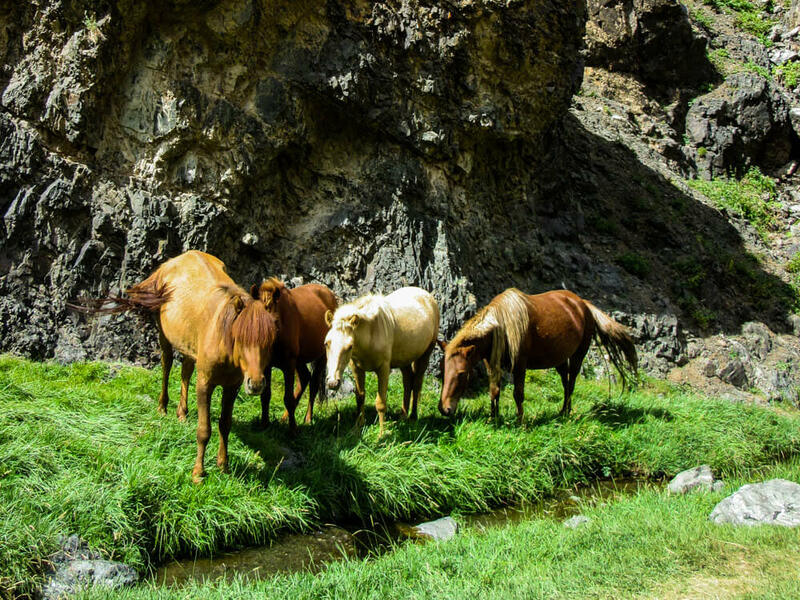 Whichever means of transportation you choose, both will take you to Ulaanbaatar, from where you can arrange a tour through the Gobi. Do not enter the desert by yourself. DON’T DO IT. The distances are gigantic, water is just as scarce as people you’ll come across and a car that breaks down can be fatal. Most smarty-pants book a tour. The few who are brave (or stupid?) enough to do it on their own – and I did not meet any of those people – have to realize that they have to travel with at least two 4WD (read: four-wheel drive) vehicles, have to bring enough water for their entire stay and bring a GPS and a satellite phone. Plus, you have to be able to repair your car by yourself when it just does not want to go any further. So unless you’re a car mechanic in heart and soul or have a bizarre desire to get lost in the millions of square kilometers of desert in the scary I-really-will-never-ever–find-my-way-back-home-manner, just don’t do it. Just don’t. The morning sun breaks between the dingy walls of an apartment complex in capital Ulaanbaatar. A Russian 4WD grayish van is roaring in front of its door. With a filled little-week-backpack the boyfriend and I get in. Not only with high spirits, but also with five others. We are going on a tour through the Gobi. 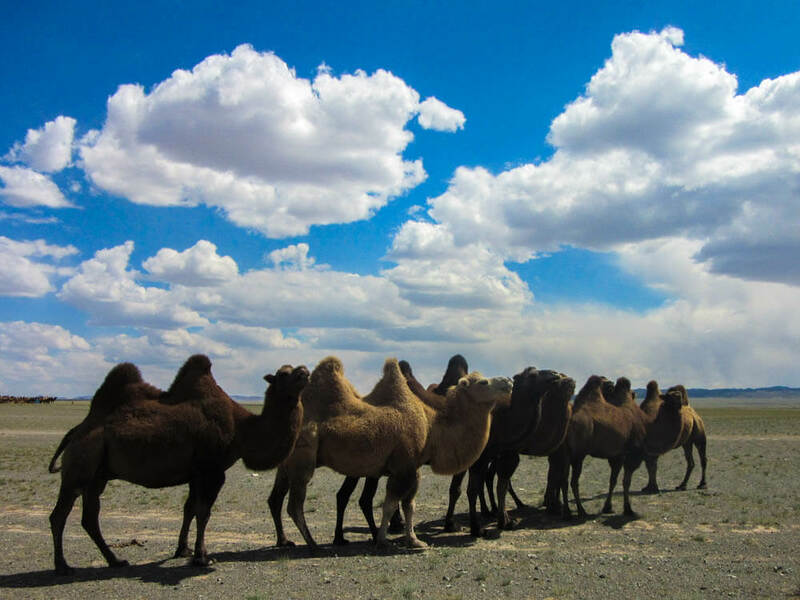 Booking a tour is basically the only safe way to discover the Gobi if you do not have a dead wish as described above. In Ulaanbaatar there are dozens of hostels and tourist offices that offer a tour through the Gobi. Please note: the quality of the tours varies enormously. We booked our tour via this hostel and that is definitely recommended to do the same, but even with them we occasionally had to pay attention that we actually were getting what we were promised. Fortunately, I will soon tell you how to choose a good tour operator, so you exactly will know what to look for. ‘Seriously? A week in the desert?!’. I can still hear my lover-lovah calling out those words. ‘Yes!’ I exclaimed enthusiastically, ‘but you can also take longer trips and I think that is also a fantastic idea’. If I were to believe the look in his eyes, I had just totally lost it. His moderately-enthusiastic reaction could, in addition to his character, be explained by his expectations. And that was sand. A lot of sand. But surprise, surprise, the Gobi desert does not just consist of sand. In fact, as you can see in my photo journal of the Gobi desert, sand is subordinate to the rest of the material of which the soil of the Gobi desert consists. And that ensures that a tour through the Gobi is not just the same-same: every day you’ll see something else. What about the orange illuminating cliffs of Bayanzag, immediately explaining why it has been nicknamed the Flaming Cliffs. Or the even in summer green Yolym Am valley with a gorge where you’ll see ice all year round. 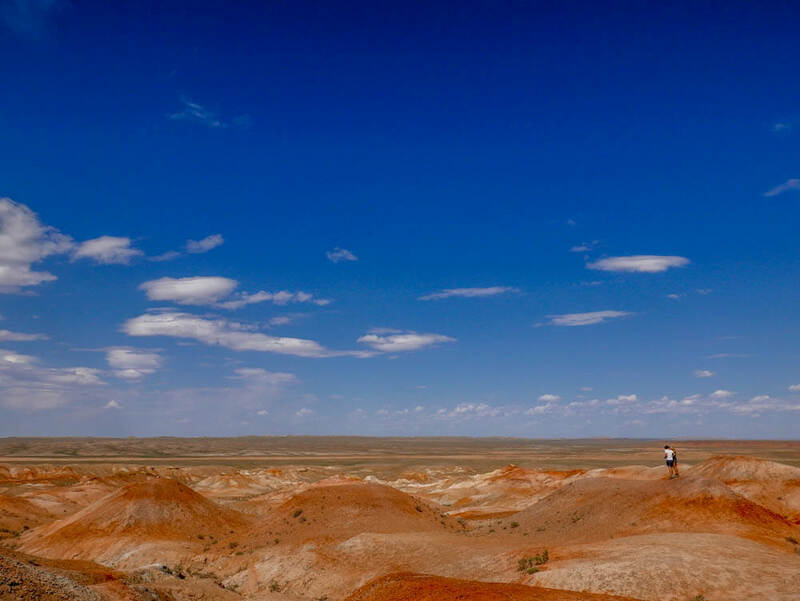 Or Tsagaan Suvarga, a red lunar landscape with a soil rich in marine fossils. Not a day is the same! Sand gushes alongside the small square windows. The wind makes the pink curtains sway to the rhythm of the well-known zero’s hit ‘Party Shaker’ which vibrates through the boxes that are easily 30 years old – at least just as old as the van probably is. Our bodies seem to do what the music prescribes: they are shaking from Rio to Jamaica. And that is not entirely surprising, when looking at the surface the van has to cross. When smoothly exiting Ulaanbaatar and leaving the huge apartment blocks behind us on the first day, that is it regarding paved roads – a few exceptions aside. And that means, one big wobbly adventure. 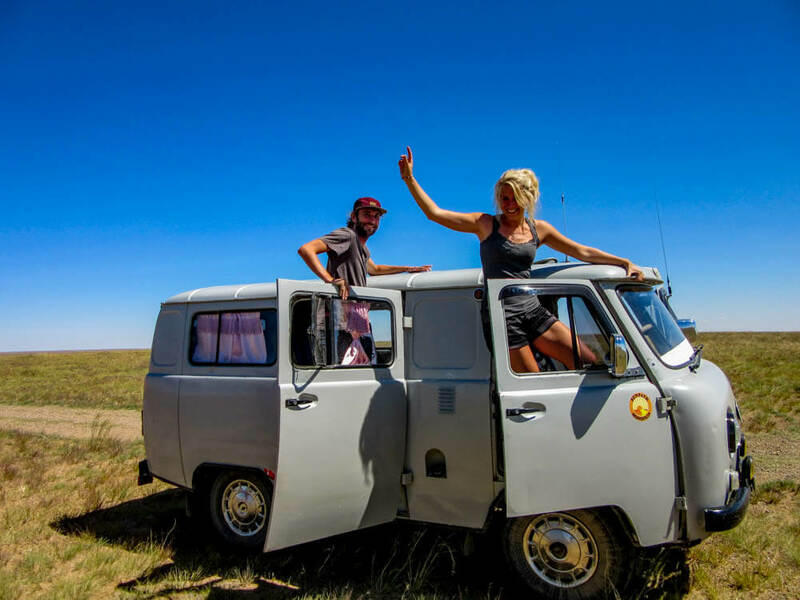 Those that are plagued by car sickness I would recommend to take some medicines for this and if you really got a bad case of car sickness, it is wise to think twice if a tour through to Gobi is really for you – if at all possible, of course just go! 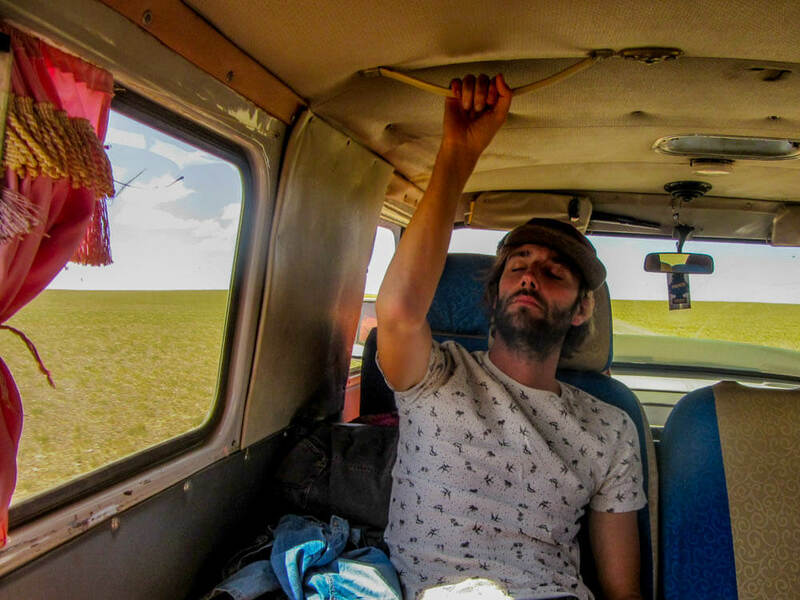 Most of the times you’ll have handles stuck to the ceiling of the van and your fellow travel mates to hold on to, so worrying about being thrown out of the van is not necessary. So…. shake it until you make it, because it’s going to be a bumpy ride. I’m not going to beat around the bush: the aforementioned bumpy ride takes a long time. Gigantically long. Every single day you’ll sit in the van for about 8 hours on the way to the next sight that you will only reach at the end of the day. In between it is sitting. A lot of sitting with an occasional break to stretch the legs. 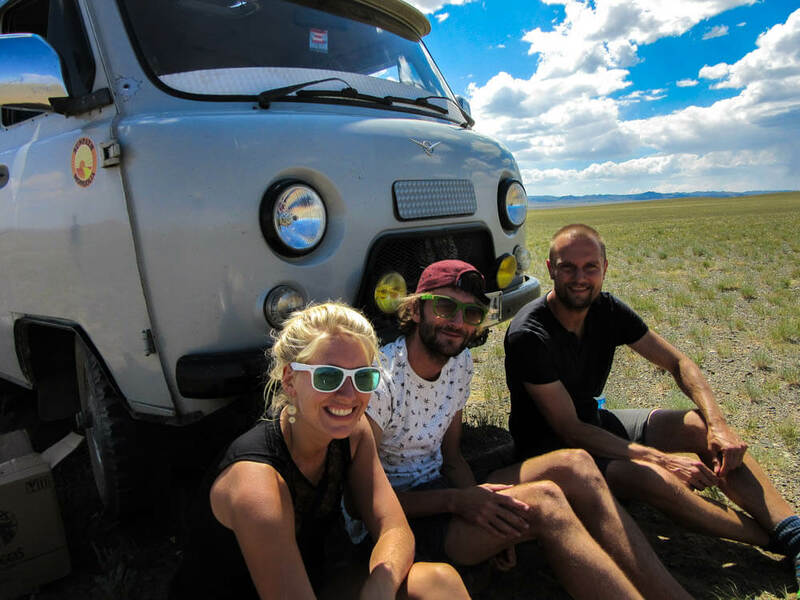 I think this is the main reason – in combination with the difference in quality of the tours – why there are also negative stories out there about a tour through the Gobi: you must feel like it and especially have your mind set to the long drive. Fortunately, you’ll now have both, after having read this post. We are leaving Khongoryn Els, the sand dunes of which the sand seems to lie on a slope like a blanket and where sharp corners are formed by the forever blowing wind. With the sun on my face, I start to doze off a bit. A big hole in the non-existent road not only makes me land firmly back in the van of the living, but my body also flies with full commitment on the lap of my neighbor. 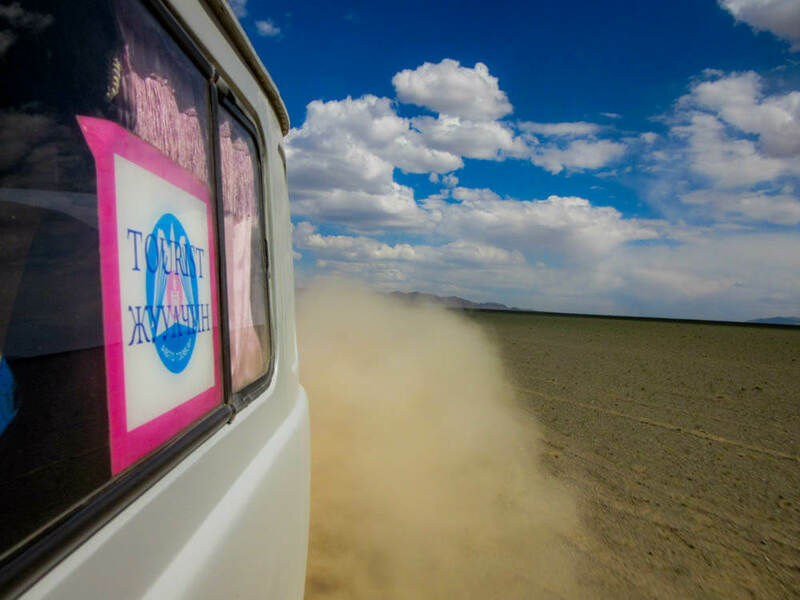 The van with which you’ll tour through the Gobi is not a private van – unless it is low-low-season, you pay a fortune to buy all the seats or are just in plain luck. That means cosying it up with your temporary-co-van-occupants – whether or not desired. Turn these fellow travelers into your temporary best friends: it will make the journey a lot more pleasant. There he is again, our transparent alcoholic friend with a kick: Vodka. 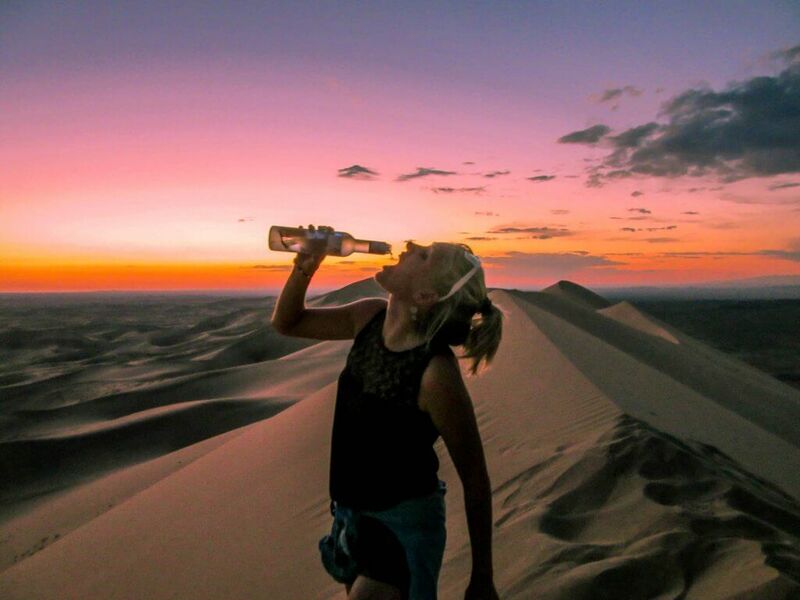 Taking Vodka with you on your trip is a recurring phenomenon if you take the Trans Siberian or Trans Mongolian Express, which I told you about here. Although not a traditional Mongolian drink, it is one of the most consumed drinks in the country since it was imported by the Russians during the communist era. Buying a bottle (or two) in Ulaanbaatar is not only a good icebreaker when staying with local families, your car buddies will appreciate it too. Even better: let them also equip themselves with some Vodka. Have they forgotten or is your inventory running out fast? During your tour through the Gobi you will occasionally encounter a local shop: the deeper into the desert, the more expensive it will be. In Ulaanbaatar you’ll be able to buy a big bottle of Vodka for about € 3,-, in the desert this goes up to € 10,-. Still no money. Yes, the landscape is diverse, as I mentioned before, but it is often only at the end of the day that you’ll end up in a completely different environment: during the day there are many moments in which you’ll see the same old scenery flashing by. Being able to entertain yourself and your fellow companions is therefore a much welcomed quality. So be creative. The number-pate-game might not be an option with hardly any vehicles around, but there are plenty of (make-along) games that you can play. Name the camels and find an imaginary life story for them. Observe your environment closely and play ‘I spy’ (although you’d probably more easily run out of things to spy with your little eye in the desert than in a busy metropolis). Play a drinking game in the bouncy-van – one hand to your glass, one hand to the handle on the roof, please. Or follow our example and use the stones from the desert for a game of jeu de boule during a break in the blazing sun. They may not roll, but hey, that makes it even more exciting. ‘I need to use the restroom’, the chica next to me says. ‘Ok, go’, and our Mongolian tour guide cheerfully points to the nothingness lying in front of us. You are in a desert. There is no running water or electricity, let alone a toilet. And depending on the part of the desert you are in, there is no tree to hide behind. At some nomadic families there is a one-by-one meter wooden shack fabricated for some sort of privacy, but that’s it. So leave your embarrassment at home, wait until the gleaming sun disappears behind the horizon and no one can see anything – let alone you – and squat. Oh, and taking a shower, basically forget about it. 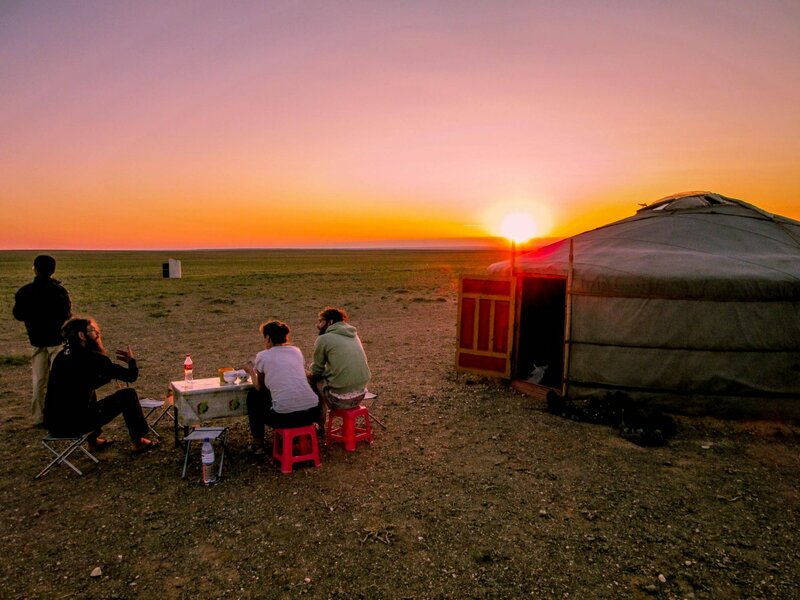 There are now some places where modest tourist camps have been established, for example at the Flaming Cliffs, where showers are present, but generally there is no running water. During some tours, you will pass through a village where you have the opportunity to take a shower in a public bathhouse for a few euros, but do not count on it. In connection with the previous point, another way of life and view of the essentialness of planning requires some flexibility and in the general rule is: let it go! Accept that not everything always goes according to your – or any – plan. Having said that, there is nothing wrong with standing your ground if promises that were really important to you are in danger of being broken. You pay for the tour and they have to deliver what is promised. The ultimate example of this can be found in the article that will be published here shortly: about what to look for when booking a tour through the Gobi desert. From the edge of a rock formation that has been shaped by thousands of years of wind and which looks like a city of stone from afar, I am staring at the sea of red hues that lies beneath. The water of the sea has dried up millions of years ago and the only thing that still reminds us of those times is the red colors of the soil that represent the different era’s that passed since.